We’ve assembled a team of six media members across the state to each select one player (or unit) each week. We will track the cumulative statistics of our selections throughout the season similar to fantasy scoring. Check back next week to see our picks for week seven, and how the players performed that we picked the week prior. See the bottom of this article for details. Avila is one of the state’s leading receivers this season. The junior has caught 34 passes for 553 yards and six touchdowns. Luke had 170 receiving yards and three scores in the Cowboys 31-28 over Hugoton. He also had 100-yard receiving games against Wray (Colo.) and Scott City. Avila may be in line for a big receiving night when the Cowboys travel to one-win Russell. The junior running back for the Bombers has rushed for more than 1,000 yards, as well as 24 touchdowns this season. He's averaging more than 12 yards per carry and has two receiving touchdowns. Wakefield will likely go to Melius early and often as the Bombers travel to face Lakeside-Downs on Friday. Raleigh, a 6-foot-2, 170-pound senior, is having a breakout season for Hesston after being injured most of last year. He’s made the move to quarterback from receiver and has 983 passing yards (13 TD) and 803 rushing yards (12 TD) through the first five games of 2014. Not only a standout this football season, as an all-state selection, he helped lead the Swathers to the 3A state basketball title last March. While the Irish were manhandled by Abilene in the battle of Dickinson County last week, Steck, a junior running back, posted another 100-yard rushing game with 112 yards on 25 carries. He tallied 134 yards on 25 carries in a Homecoming win over Clay Center. He should find more room to run this week against a winless Marysville team that has allowed at least 39 points in each of their last four losses. Waggoner has enjoyed a breakout season in his third year as a starter. He has completed 38 of 79 passes for 736 yards with 17 scores against four interceptions. Quinter, 3-2, 1-2 in Eight-Man, Division I, District 8, has averaged 41 points per contest. 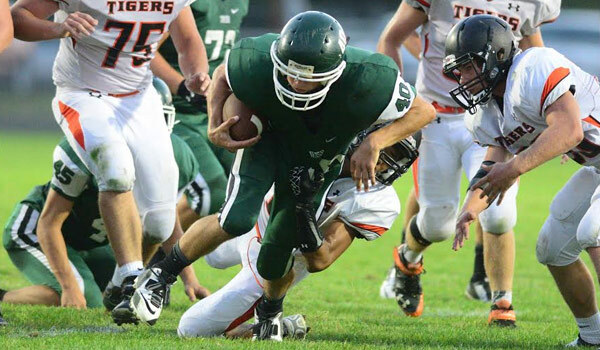 Quinter faces Logan-Palco for Homecoming in a virtual must-win for both teams. Logan-Palco (3-2, 1-1) has allowed an average of 55 points per contest in back-to-back losses. Williams (5-11, 215) has been a workhorse for the Wildcats all season long. The senior has especially shined in league play and could have another 200 yard performance against KC Sumner Academy this week. **points total from first four weeks.